Dhiren Barot has been sentenced to life in jail after pleading guilty to conspiracy to murder people through a series of bombings on British and US targets. Here is a summary of the prosecution case outlined at Woolwich Crown Court. Dhiren Barot, 34, a Muslim convert, was a "member or close associate" of the al-Qaeda terrorist organisation. 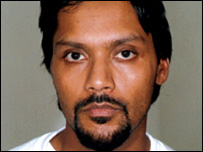 The UK citizen had been under MI5 surveillance and was arrested in London in August 2004 after police decided he was "simply too dangerous to leave" on the streets. Barot received extensive terrorism training in the use of weapons and explosives for the first time in Pakistan in 1995. Material recovered and used to form the prosecution case included documents, e-mails, DVDs and computer hard drives. The most developed plot was the "gas limos project", a plan to blow up three limousines "packed" with gas cylinders and explosives next to or under target buildings in the UK. Arson through hijacked petrol tankers and the use of an aircraft were among other possible methods of attack considered. There were plans to detonate so-called dirty bombs - explosives devices containing radioactive material. Barot carried out "substantial research" into the dirty bomb project, placing the details in computer files called "Brad Pitt" and "radioactive children". He stated he wanted to "emulate" the Madrid train bombings, which killed almost 200 people in March 2004 with co-ordinated back-to-back attacks. The US plans were drafted earlier and used to help to conceive the UK plot, headed by the gas limos project. The plans were taken to Pakistan to be presented to senior al-Qaeda figures for approval and funding. But the prosecution did not dispute a defence assertion that no funding had been received for the projects, nor any vehicles or bomb-making materials acquired. The plans for attacking the UK were contained in the presentation for the gas limos project discovered after a raid by the Pakistani authorities in Gujrat in July 2004. Targets included the rail and underground network in London, with the Heathrow Express, or an explosion on a Tube train in a tunnel under the River Thames cited as possible incidents. Other sites identified were London hotels, including The Ritz and The Savoy, and stations such as Waterloo, Paddington and King's Cross. Barot assumed a number of identities in a bid to "cover his tracks" and had at least one false passport. He once travelled from London to Swansea just to use an internet cafe. He assumed a false identity to gain access to the library at Brunel University in north-west London for research and appeared to have accessed other specialist libraries. Plans to carry out bombings on the US were initiated before the September 11 2001 attacks, then shelved, but still worked on as late as February 2004. Specific targets in the US plot included the International Monetary Fund and World Bank buildings in Washington, the New York Stock Exchange and Citigroup buildings in New York, and the Prudential building in Newark, New Jersey. The US plans were prepared after reconnaissance was carried out by Barot during visits in 2000 and 2001. A video of the Bruce Willis film Die Hard With A Vengeance seized from a London garage was found to have footage shot in New York in April 2001 at the end of it. The filmed showed various locations in New York - focusing on entrances, security cameras, barriers and side streets as well as Jewish buildings, including synagogues. Film footage of the World Trade Center featured a voice making the sound of an explosion. Prosecutors said the Crown was not suggesting Barot had "knowledge" of the 9/11 terror attacks, but it "does demonstrate a more than unhealthy and violent interest in attacks on iconic buildings". Material recovered in Barot's computer files used seemingly innocuous words to represent different topics such as "monty", "children" and "uncle" to cover research into explosives, gases and chemicals. Deleted material uncovered on a hard drive revealed files containing research into topics such radioactive materials, homemade bombs, arson attacks and fire protection systems. A handbook listing hazardous chemicals was found, as were notebooks containing references to books on subjects including explosives, chemical and biological warfare, and building structures. "Shopping lists" of electrical items that could be used to construct an "improvised explosive device" were also seized, as was the text of a statement by Osama bin Laden "glorifying the September 11 attacks". Barot set up temporary e-mail accounts to send coded messages and adopted anti-surveillance techniques.